regardless of the device you are using. means that this new airtel package is suitable for all. 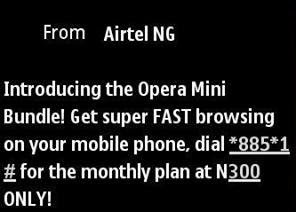 How Can I Get The New Opera Mini Bundle? ==>Dial *885*1# and the plan will be activated for you. Hello Enitan, i haven't try it on pc but if your pc has opera browser, it suppose to work. Good morning prof. It seems everyone is enjoying the glo stuff except me, this is my number if you will be kind to share with me too. 08056580503. Thanks in advance. This Airtel opera Mini is it unlimited ? and pis Pro share me the glo stf,08116986343. Thanks Man. so u can connect n disconect at wil n as plses. yomiprof I have a problem,I noticed this with the unlimited whatsapp,it says u must ve 1 naira min but phone keeps eating from my credit until no credit is left,ie no credit no unlimited watapp,or bbm .now how ll I do this opera stuff and even unlimited bbm without taking all my credit? am using a samsung. Now That MTN BIS on Android is Blocked, What is The Way Forward?